Titanium Studs that we import, export and supply are extensively in demand amongst buyers owing to its accurate dimensions and high corrosion resistance. We make available Titanium Studs in diverse grades & sizes to meet different application requirements of the buyers. 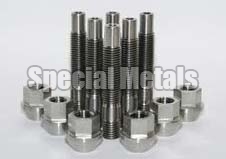 As a dependable name, we source Titanium Studs only from the reliable manufacturers or vendors after checking against numerous quality parameters. THE PACKAGING WHICH WE PROVIDE IS OF TOP QUALITY AND EXPORT WORTHY ENSURING SAFETY OF THE PRODUCT FROM ANY KIND OF DAMAGE.